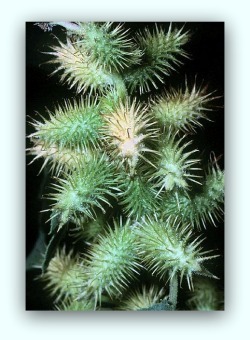 Xanthium is also known as cocklebur, Cang Er Z and Fructus Xanthi. Cocklebur is a genus of herbaceous plants which belong to the Asteraceceae family. It is native to eastern Asian and the Americas. They grow anywhere from 1.5 to 4ft tall. They are short day plants, which mean that they start to flower in late summer to autumn when the days get shorter. The plant is used in Traditional Chinese medicine and other tradition types of medicine for a variety of ailments. It has been used for malaria, insect bites, sinus problems, tuberculosis, rheumatoid arthritis, lumbago, leprosy, diarrhea, constipation and fungal and bacterial infections. Cocklebur is available dried or fresh, as a capsule or pill and in powder form. Scientists from the Department of Pharmacognosy, University of Szege, Hungry have found 4 compounds in xanthium that show antitumor activity. Researchers from the Department of Oriental Pharmacy, College of Pharmacy, VCRC of Wonkwang University and the Department of Pharmacology, College of Oriental Medicine, Kyung Hee University conducted tests on mice in 2002 and concluded that cocklebur might be affective in treating some types of allergic diseases. Cocklebur taken in large doses can cause diarrhea, nausea, intestinal spasms and vomiting. The seeds and the burs have toxic substances. The burs can be removed by frying them. Under Chinese department of health guidelines if cocklebur is used only externally, all foreign matters should be eliminated. If cocklebur is taken orally, it should not be ground into a powder or pounded. Chinese medicine practitioners must indicate that it is Stir-baked Fructus Xanthii if it is prescribed for oral use. Non-stir-baked cocklebur must only be prescribed for external usage.